GENRE FICTION GETS GROOVY WITH NEW BAND OF ADVENTURE! THE LEMON HERBERTS DEBUTS FROM PRO SE PRODUCTIONS! Known as an innovator in Genre and Pulp Fiction, Pro Se Productions lays claim to that title once again with its latest release. 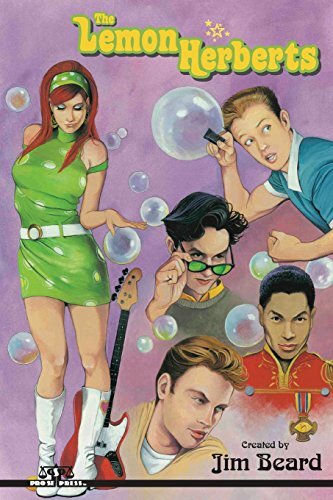 From the far out imagination of creator Jim Beard comes a band of musicians and heroes that redefine ‘out of sight’ in a new anthology! Get ready, cats and kittens, for The Lemon Herberts! MADNESS! Beat it, Beatles! Move over, Monkees! Roll it up, Rolling Stones! Here comes the greatest, grooviest, gearest rock-and-roll group of all time: The Lemon Herberts! Hot on the heels of their chart-topping hit album, Redwing Blackbird’s Summer Solstice Tea Party, the Lemon Herberts launch themselves on their very first world tour – and straight into more danger, more peril, more sheer adventure than they ever bargained for! In six kicky, pulpy, far-out tales, you’ll meet drummer Ellroy, guitarists Honor and Dilly, bassist Ally, and the gorgeously fab Her Majesty – trouble-magnets that even their long-suffering manager, the mysterious Brighton Hawks, can’t hope to contain. Just ask the Lemon Herberts’ legion of screaming fans: they’re wild, they’re wonderful, they’re simply the most! Herberts’ creator Jim Beard leads a band of groovy authors- Nathan Meyer, M. H. Norris, Rocko Jerome, Sam Gafford, and Joseph Lamere- for a New Pulp collection that will have you tapping your toes and humming along as The Lemon Herberts conquer the world, shining their music into hearts both dark and light around the globe! Featuring an awesome cover by Michael Hegedus and print formatting and logo design by Forrest Bryant, The Lemon Herberts is available now at Amazon at http://www.amazon.com/Lemon-Herberts-Jim-Beard/dp/1514690284/ref=sr_1_1?ie=UTF8&qid=1435515082&sr=8-1&keywords=lemon+herberts and Pro Se’s own store at www.prose-press.com for 15.00. The band’s debut anthology is also available as an EBook, designed and formatted by Bryant for only $2.99 for the Kindle at http://www.amazon.com/Lemon-Herberts-Jim-Beard-ebook/dp/B010EAQQOY/ref=tmm_kin_swatch_0?_encoding=UTF8&sr=8-1&qid=1435515082 and for most digital formats via Smashwords at http://www.smashwords.com/books/view/553898.